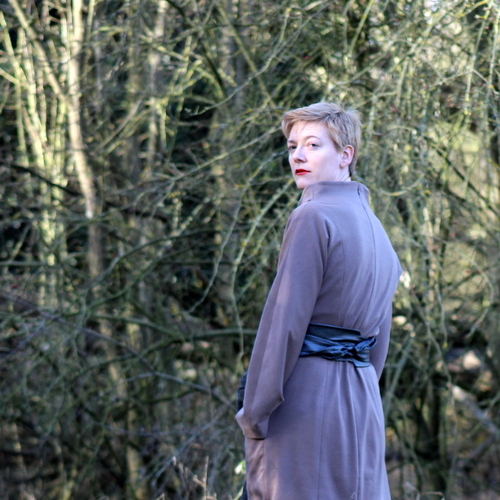 I recently made Vogue 8512, a style which definitely needs a belt. I’m one of those people who never really figured out accessories so I don’t own a whole lot of belts, and none of my existing collection went with it particularly well. Clearly a new belt was required. I asked for advice on the blog and the consensus seemed to be that something metallic would fit the bill. Janene suggested making a belt out of metallic pleather, and it just happened that I had a scrap left over from a very scifi Burda dress I made a few years ago. There was enough to make an obi belt with piecing, even after I accidentally melted a bit with the iron. There are a lot of tutorials out there on the Internet for how to do this. I read through quite a few of them but didn’t end up following any particular one religiously. Here it is. The straps ended up long enough that I can tie them in front and take them back around to the back which I like because when I tie them in a bow at the front it always looks messy. I have tucked the ends in at the back here. It still looks a little messy but so does leaving them untucked, and I certainly don’t want a bow at the back. 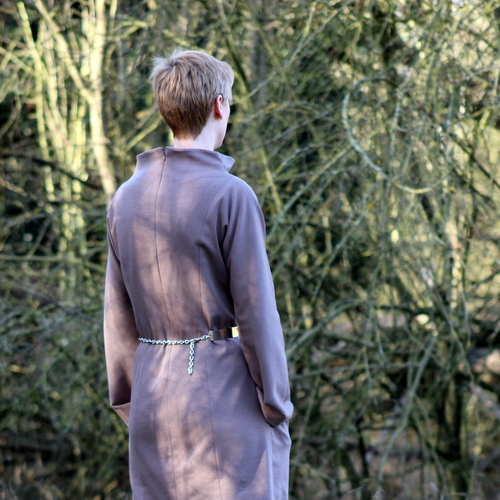 As well as making the obi belt I also bought a silver metal belt. This particular one came from ASOS but you can find similar ones all over eBay and Amazon. I figure this is plain enough to go with quite a few of my other dresses too. I like them both although it has to be said now I’ve tried them both at work I’ve found the pleather one is more comfortable to wear. 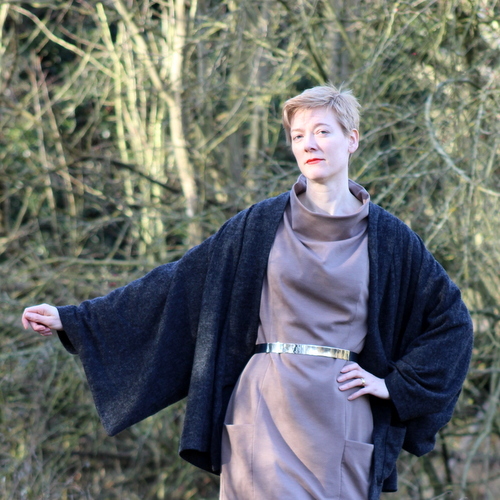 Posted on February 13, 2015 February 8, 2015 by catherinedaze	This entry was posted in belts, Finished, sewing, Style and tagged belt, obi, sewing, vogue. Bookmark the permalink. Yes I like them both too. I have quite a few fabric belts. It’s a nice way of introducing a second textile to a plain outfit. And it defines the waist. Yes the belts look great. But something about these photos really grabs the attention. Your best ever. I think in that first photo and the looking over the shoulder shot you could fit right into a fashion editorial. Love the lip color. happy sewing! The pleather belt goes perfectly with your dress. It does wonders for the silhouette and the knotting detail in front is so cool! I love the funnel neckline too. A beautiful outfit! Perfect on both counts. I love the chain detail of that silver belt. And I must agree with Beth about the photos. Those first two are really really eye-catching. Never figured out accessories either. Love the flash of the silver but think the obi works better. I like them both, but favor the pleather one. I love this outfit, comfortable and stylish at the same time. Love the pleather one. I agree with SunnyGal, the photos look like they are out of a magazine spread. Great job! i meant to add, I think the outfit needs the width of the pleather belt. The silver one seems too skinny. Both great looks. Congratulations on getting pleather to behave too. I never figured out accessories either – I just don’t feel confident when I try to wear them! You, on the other hand, now look to have absolutely nailed belts! That first belt in particular looks very stylish, and absolutely perfect for your dress. Oh and I have to agree with a couple of the earlier commenters – you look amazing in these photos! I love how the collar is standing up a little. 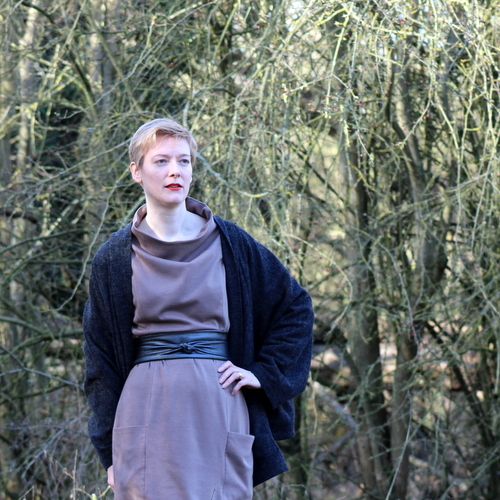 And the darker plether belt goes lovely with the heather coloured dress. The metallic belt could be saved for dressier occasions maybe? A little stockpile of belts is always handy in my opinion. Keep picking out a few more, just in case. I like both of your belts.They each give the outfit a different look. My favorite is the first belt, it define your small waist so well, you look like a magazine model, dear friend. Wonderful dress.